The condition of the grips, rather than the calendar, indicates when you should change them. There are two ways to tell when you need to regrip your clubs -- if your grips look worn or if they are slippery. You should replace your grips about once a year, depending on how often you play and the conditions in which you play and store your clubs. If you don't use a glove, you might have to change your grips more often than the recommended time frame. Change your grips every 18 months if you play golf two or three times a week and you live in a temperate climate that does not allow year-round golf. You are not overusing your clubs and you are not wearing down your grips. They should last you at least 18 months. Replace your grips at least every 12 months if you are playing four or more times a week in temperate climate. Your clubs should last you five or more years, but to get the most out of them, you should change that grips yearly. Sweat, grime, high temperatures and other weather conditions will compel you to change your grips if you want to get the most out of them. Change your grips every nine months if you are playing three times a week or less in an extremely warm or humid climate. The hot weather will have an impact on the clubs and will either wear out the leather or stretch the rubber. You are not likely to see a difference in your grips, but you will feel the change. When grips get worn out they tend to get stiff and hard. Replace your grips every six months if you are playing four times a week or more in high heat and humidity. You are putting your clubs to the test and that will not wear them out but it will ruin your grips. Sweat, heat, humidity, grime, dirt and sand will all tend to tear apart your grips. They will lose their elasticity quickly when you use them that much. 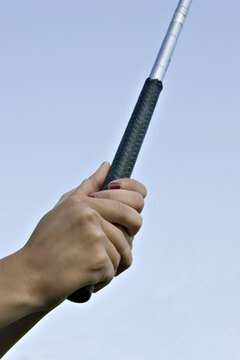 Change your grips every two years regardless of the conditions if you don't play more than twice a week. The rubber will lose its elasticity and the leather will lose its moisture. You want a club that responds to your grip so don't hesitate to change them if two calendar years have gone by since the last time you replaced them. Do I Need Custom Fitted Golf Clubs?